I have in my hands the fastest stock single GPU in the world. The market is flooded with companies that make video cards. Between manufacturers, most of these cards are technically identical to each other. Hailing from Taipei, Sparkle Computers has been making components since 1982. Their site details their endless pursuit of quality, and their commitment to service. Today I will be looking at their GTX480. Sparkle prefers to let the card speak for itself. Their product site is devoid of flowery press related text. 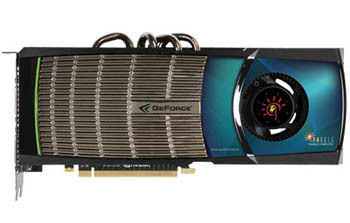 This card is the fastest single GPU you can purchase as we initially stated. Between the raw power of the nVidia GTX 480 GPU and the quality of product Sparkle promises to give each of their products, this top of the line video card should deliver amazingly consistent and awe inspiring performance for users that demand it. Join me as we inspect and thoroughly test this monster of a card. can pictures of item get any shittier?